Vanessa is tough to beat on the green felt. Poker celebrity Vanessa Rousso’s Big Slick Boot Camp is working with PokerStars on a series of Ladies Only Boot Camps. “Being a successful poker player is a combination of skill and confidence,” Rousso says. “Since men far out-number women in the poker community, it is imperative for female players to display a strong level of confidence in their game to avoid being perceived as an easy target…this type of intimidation tactic can easily compromise optimal playing ability.” The boot camp is designed to provide women with skills and techniques to improve playing ability, as well as effective strategies to develop a level of confidence that commands respect at the poker table. Rousso may be the top female player in the world, and has become one of the most sought after poker instructors. Her ability to teach the game is evidenced by numerous accolades from students who attribute their increased earnings to what they learned at her Big Slick Boot Camp. Of the 50 players who recently attended Rousso’s Boot Camp at the Biloxi’s Beau Rivage Casino, 8 cashed in tournaments earning over $50,000. Last year, one of them cashed for over $40,000 from the Main Event. The first EPT Ladies Only Boot Camp will be held April 27, in Monte Carlo (France). The 6-hour women only event will offer a 1-hour photo and autograph session followed by a 5-hour instructional boot camp. Rousso will focus on the theory of poker and highlight specific areas that pertain to women players in a male dominated game. The cost of the Boot Camp alone is $400, and can be purchased at www.bigslickbootcamp.com. Vanessa Rousso has stormed the poker world, but slipped and fell at Caesars Palace and broke her foot an hour before her match with Barry Greenstein at the National Heads-Up Poker Championships Saturday. It was her right fourth metatarsal. Rousso was scheduled to present a free two-hour poker seminar Friday before the Isle Casino & Racing’s Battle at the Beach main event. She will need to cancel, her mother said. Recovery time isn’t yet determined; more doctors’ appointments are still booked. The main event with a $900 buy-in, is a $150,000 guarantee with Day Ones on Friday and Saturday and Day Two on Sunday, continuing to Monday if necessary. At least for now, Annie Duke is arguably a hotter lady player than Vanessa Rousso. 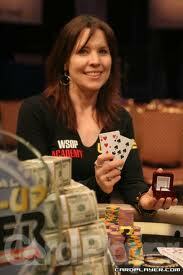 The former Celebrity Apprentice runner-up Annie Duke was out to redeem herself after her prior NHUPC 1-5 record. Winning the NHUPC title, Duke takes home $500,000. She becomes the first female winner in NHUPC history, while also reasserting herself as poker’s most prominent woman a year after GoDaddy poker babe Vanessa Rousso seemed poised to start staking such a claim with her second-place finish in the NHUPC. Duke demonstrated her respect of Rousso with some strong words of praise for despite Rousso’s early elimination this year.